What do parents think of the program? "I highly recommend the Music Together® classes which I have been taking with my 14 month old daughter. Though I have been a musician, dancer and singer for years and started sharing these with my baby before she was born, I have learned a lot from these classes about how to bring these dimensions of the human adventure into her world in a way that is fun for both of us (and in a way that avoids the traumas of my own childhood music education)." 1) The teacher is fun, down to earth, musically adept, welcoming, playful, respectful and inclusive of each person there. 2) The singing and playing of rhythm instruments is always done for joy and adventure of it and is not associated IN ANY WAY with "performance" or doing it "right". We are making music together - no child (or adult!) is put on the spot to perform in front of others. I guess I would say that the atmosphere is one of celebration rather than performance. 3) The music making is almost always accompanied by movement- marching dancing with beautiful scarves, shaking various rhythm instruments, etc. I've learned a lot about how to create such whole-body-music-expression for my child. The best musicians also dance, the best dancers are also musicians. I want not just her fingers and brain to hear and play music but for it to be part of her core sense of Self. I want her to both feel joy and to know how to express that fully and articulately, thus my delight in gaining tools at Music Together for sharing this with my daughter at home. This is where I learned how to translate what I wanted to share with her into toddler-ese. 4) The classes are both fun for me as an adult, and age appropriate for the toddlers on up in our class. 6) I like most of the music as well as the variety. I am particularly fond of interesting rhythms, such as the Balkan music and crooked French Canadian tunes. 7) I like the other parents in the class. 8) I also like that if I miss class, I can make it up on another day, as there are classes offered several mornings each week. I am a mother of two small children (boy- 4 1/2, girl - 2 1/2). I have participated in Music Together, Kindermusik, and Kids In Tune with one or both of my children since my oldest was 15 months, (late start, I discovered)." "I highly recommend Music Together for kids 0-4 (some even older still enjoy this method of music explanation). I found it to be the most engaging nurturing and fun way to develop both rhythmically and tonally. As a participating parent I developed my own musical understanding and range.I have been learning how to encourage my kids without being pushy and to spot developmental landmarks." "The process also got my husband to sing and even pull out his old guitar! Our enjoyment of the program has encouraged the kids to pursue their own creative music making. Even the little one is starting to "compose" as well as mimic all she hears." All of these programs encourage you to play at home and not to expect your child to "perform" in class. 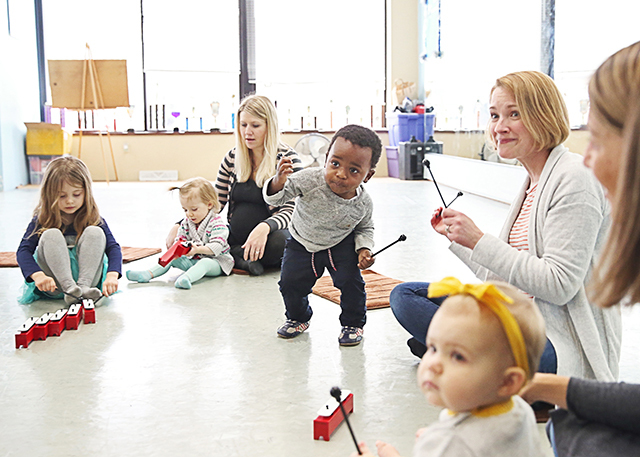 I found it true with all the programs that kids will exhibit MUCH more of their understanding outside of the class, but my kids displayed more enjoyment during class at Music Together sessions than at any of the other programs for children that age. What should I expect of my child? As you participate in class, listen to the CD together and try the activities at home. What kind of response should you expect? Some children are spontaneous singers and movers, others are careful and astute observers. In either case, after sufficient listening and observing time at home and in class, you may begin to notice your child singing or chanting parts of songs, sometimes with words, sometimes without. However, even when your child gives no response or seems uninterested in listening or participating, important unconscious learning is taking place. - Most children choose (wisely) to observe more often than to participate actively in class. They are taking in information, which they will act on later at home. - Most children become accustomed to the class routine and their classmates around the fifth or sixth week. At this point, their participation is likely to increase. - Children are assimilating important music information whether or not they are outwardly participating. At home, this means it may be important to play the tape or sing the songs yourself even if your child seems to be unaware or uninterested, especially during the first few weeks of class. Remember that you are the most important model and teacher for your child. Your most effective role is to participate and enjoy the class yourself, even though your child might choose to sit back and observe. If you are enjoying yourself, your child will soon wish to share that enjoyment with you. We know it might be difficult to watch other children zealously participate in the group while your child does not. This is especially true if your child performs all of his class favorites as soon as you arrive home. Try to understand that he is very wisely "practicing" in private and will make his public "debut" when he feels more confident. Meanwhile, if you feel suddenly overwhelmed with frustration by the lack of your child's participation in class, just count to three, relax, and participate yourself.! What should I expect of myself? Some parents are somewhat disconcerted by the concept of being their child's most important role model, especially when it comes to music! You may feel that you are not particularly musical - perhaps you even describe yourself as being "tone deaf". You may be great at singing but feel unsure of yourself or "vague" when dancing or trying to "keep the beat". Whatever the level of your technical skill, remember the most important things you can model for your child are simply pleasure, interest, and the desire to participate in music activities. Many adults feel deprived, confused, or inadequate about their ability in music, as if they have been denied something that should be effortless and natural. In fact, this is often the case. As your understanding of your child's music development grows in the coming weeks, you may also come to understand that unfortunate circumstances in your own childhood music experience may be at the root of some of these feelings. More important, by participating with your child, you can begin to rediscover within yourself the natural human musicality that is everyone's birthright. What about practicing at home? Play your Music Together CD at home. If there is a CD player in the car, it's also great to play the CD while driving. Do not limit it's use to the car, though - children are less able to move to the music while strapped into a car seat! Many children will want specific songs repeated again and again. Try to accommodate them by going back for them right at that song. They crave the repetition because it is necessary for their development. Repetition is one way they "practice". Another way they "practice" is through spontaneous, playful imitation of the songs and activities they experience in class. These imitations will, of course, probably not be "correct" but they will certainly be fun! Some children may not demonstrate interest in the recording. Right now, they may have different developmental needs and interests or simply have other current favorites. Perhaps they haven't adjusted to the class experience yet and are holding some enthusiasm in reverse! Just play the tape in the background, perhaps as they play or take a bath. Their interest in both the class and the CD will grow with familiarity. The CD provides a way of reinforcing and following up on the class experience of live adults participating in live musical activities. The more you can continue this kind of participation at home by singing the songs or doing the chants and fingerplays yourself, the better it is, as long as you do it in the spirit of fun and enjoyment. Nothing sets a better model for your child than doing an activity you enjoy yourself. Remember to use the songbook, even if you don't read music! Use it like a story book and "read" the songs to your child, especially the ones with pictures. In time, you might suggest that your child draw his or her own pictures for the songs, especially for those that don't have one! Notice the effects of your child's experience in class and note his listening habits with the CD at home during the week. Write down or remember any questions you might have about your child's responses and then ask your teacher and discuss with other parents in class.